Landmark Information Group has become the first company in the world to offer DNA tests to help employees manage their diet and boost their fitness. Landmark has teamed up with British Olympian and double Commonwealth 2014 Games Medal winning cyclist Jess Varnish and British nutrigenetics firm DNAFit Life Sciences to offer DNAFit, a test which reveals the best workout and diet to help weight loss and improve wellness. Jess has used the DNAFit test to refine her training and 50 employees at Landmark’s offices in Exeter, Reading and Brighton have followed suit, including CEO Mark Milner. All will receive their own bespoke DNAFit diet, nutrition and exercise plans to help change their lives. All employees were invited to attend genetic workshops hosted by DNAFit Consultant and athlete Andrew Steele, who used the programme as part of his training for the British Olympics men’s 400m. It’s the first time a company has offered a genetically guided corporate wellness programme. Landmark’s health and wellbeing initiative comes at a time when the NHS has raised concerns that obesity is causing millions to suffer life-long illness. NHS Chief Executive Simon Stevens will publish plans next month to encourage private companies to help employees lose weight by holding slimming classes, running clubs and promote cycling. The revolutionary DNAFit test – which made news around the world when it was revealed it was being used by English Premier League soccer teams and Olympic athletes – scans up to 45 gene variants linked to a body’s capacity to cope with training and food. The tests reveals if a person is best suited to endurance exercise (heavy cardio) or power exercise (weights and sprints), how much recovery time is needed between training and the risk of soft tissue damage. In a recent study of 191 obese people by the University of Trieste, those using a DNA matched diet lost 33 per cent more weight than those counting calories. The DNAFit test also reveals a person’s carbohydrate and saturated fat sensitivity, lactose and gluten intolerance risk, as well as their ideal diet, detox ability, anti-oxidant needs, vitamin and micronutrient intake, salt and caffeine sensitivity. Landmark staff also turned science fact into pedal power in Landmark’s Bike Week ‘JESS’S JOGLE’ challenge – to ‘virtually’ cycle the distance from John O’Groats to Land’s End (955 miles). 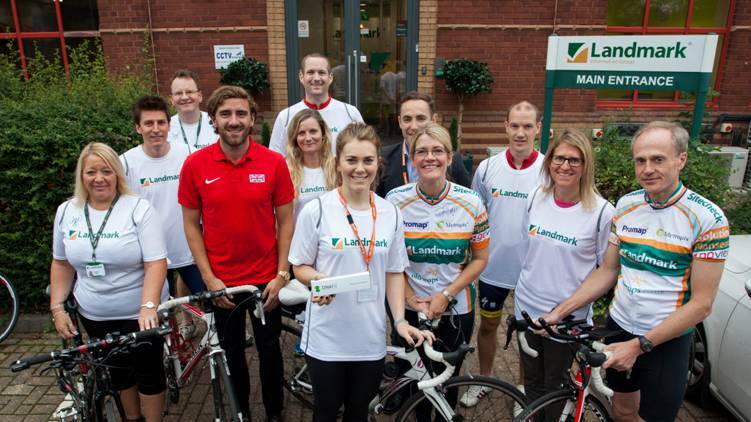 Exercise bikes allowed all employees to take up the challenge and were located at Landmark’s offices in Brighton, Exeter and Reading. Participating employees helped to raise money for Cycling Projects, which promotes accessible cycling nationwide.